Stop Snoring With Good Night Stop Snoring Ring! A natural, non-invasive and elegant way to help reduce or stop snoring. 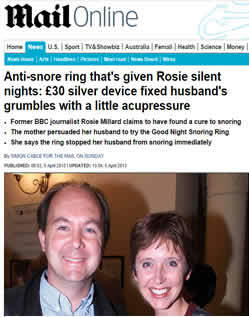 The only genuinely fully clinically-trialled snoring ring. Good Night Snore Ring could work for you. If it doesn't, we refund you in full. Guaranteed. The snoring ring is worn on the little finger an hour before sleep and through the night. There are not one, but two points inside Good Night Snoring Ring. These apply light pressure on specific points on the wearer's little finger. Try Good Night Snoring Ring FREE for 30 days. If it doesn't work for you, return it to us for a full refund. Guaranteed. But it has produced great results for many of our customers and they've been happy to share their success with us. The ring really works! I was sceptical at first, but decided to try it and don't regret it at all. The instructions say it might take a few days for the ring to start working so I was patient. I noticed the difference on the third night. Not only that my husband wasn't snoring, but at some point I had to check if he was still alive as I couldn't even hear him breathe! I no-longer have to race to fall asleep before him or risk a sleepless night. Now - even if I hear one deep snore coming - I smile, as I know silence will follow straight after. Even after a significant amount of alcohol. I have never written a product review before but had to express how good this product is. A chronic snorer with severe sinus problems I have always caused significant problems for everyone else in the house with my snoring. I have tried everything and when I noticed this product in a store I decided to give it a go. From the first night everyone noticed a much quieter house with quiet breathing instead of a freight train... I was requested to buy a spare so I always had a ring to hand if I lost one. I urge you to try this cheap option and I hope you get a similar result. Is there proof Good Night Snoring Ring works? Good Night Stop Snoring Ring is the only product of its kind to be subjected to a clinical trial. The cheaper copies available have not been subjected to any sort of trial and are unlikely to help you. They do not offer the satisfaction guarantee and refund offer to you that we do either. The clinical trial was a randomized double blind placebo study designed to evaluate and measure the effect of the Good Night Stop Snoring Ring, it took 7 months and was run in 2013. The Good Night Stop Snoring Ring was shown to have helped in 80 per cent (yes, 8 out of 10) cases, by significantly reducing or stopping their snoring. (136 couples took part). 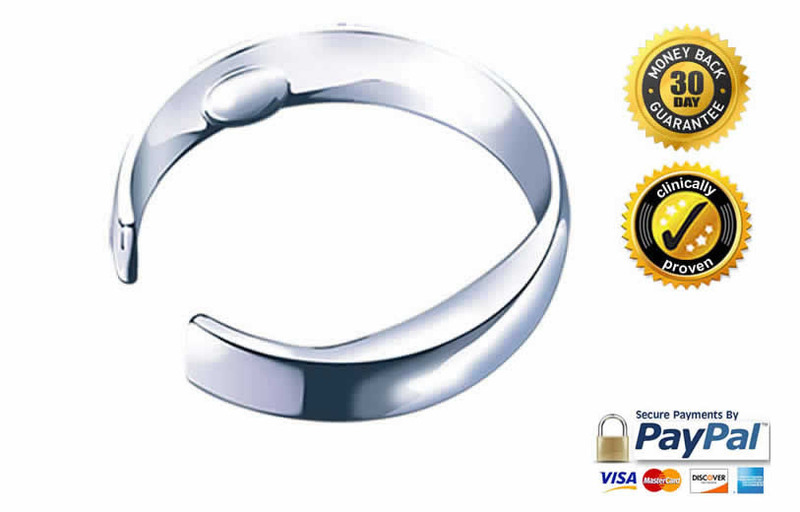 In the US, Good Night Snoring Ring has Food and Drug Administration (FDA) clearance. Q: How would you describe the ring and your experience? Here are some of the answers from the participants and their partners. The survey results showed Good Night Ring worked for just over 80% of the trial users. That means 20 out of 100 people might find it doesn't work for them and that's exactly why we offer a FREE 30 day trial, after which we will happily refund you in full if Good Night Ring does not work for you. I told my husband to try it, at first he didn't think it would work, but it did. I can bare to be in the same room as him now overnight, which is great for our relationship. he is usually cynical about alternative medicine, but it worked and he couldn't deny it. We're proud of the above comments, just a selection from 100's we have received. How Does the Good Night Snoring Ring Work? The snore ring has two 'triggers', these put light pressure on two acupressure points located on everyone's little finger, so the wearer's airways are cleared to help you and your partner get a restful night without snoring. It's a natural and non-invasive way to ensure both you and your partner wake up ready to face the challenges of a new day! Acupressure is a traditional Chinese medicine that dates back over 3,500 years. It's considered as an alternative therapy and involves applying light pressure to specific points on the body, on the basis that these points are related to lines of energy and impact other, related parts of your body. Why has this product only been invented relatively recently? Both acupressure and acupuncture (acupuncture involves insertion of fine needles at similar points to the acupressure ones) are traditionally practiced in clinics. However, there's no practical way an acupressure professional could treat snoring, without hanging about in your bedroom! Hence Good Night Snore Ring was developed. It's worth noting though that while the snoring ring itself, which applies the acupressure in the correct place to help stop snoring, is relatively new, the acupressure technique to stop snoring dates back over 5,000 years. How does this compare to a Mandibular Advancement Splint? That's a mouthful just to say, let alone sleep with. 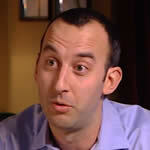 See the question about alternative snoring remedies. Place the Good Night Snoring ring at the very base of your little finger with the gap facing upwards (12 o’clock), squeeze and release the sides gently but firmly to create a firm but comfortable fit. The Acu-Activators should be located on the outer and inner points equivalent to 3 and 9 o’clock (large acu-activator on the outside). It comes with detailed instructions. There are indeed other options, from snoring chin straps to snoring mouth guards. Some of them look ridiculous to us and frankly uncomfortable too. Then there's the clinically fitted mandibular advancement splint (a mouthpiece to help stop snoring) which, if you need it for health reasons and can afford it (over £1,000 for a fitted mandibular manipulation device) we absolutely advise you to go for it and genuinely hope it works great for you. We would love you to try Good Night Ring first of course. We know the elegance of our solution stands up well and - in comparison to some of the unsightly other solutions - can help many people. Remember, this is a NO RISK purchase. We value your custom and the many recommendations satisfied customers give us, so if you're not happy, we're not! We really do happily refund. Why wouldn't we?! Not every treatment of any sort - from an an asprin through to laser eye surgery - will work in every single circumstance. 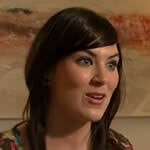 The difference with Good Night Snoring Ring is that we will refund you in full should you not be satisfied. We promise. Try the Good Night Stop Snoring Ring for 30 days and - should it not help reduce you or your partner's snoring - return it to us (the ring, not your partner) and we will refund the full purchase price. Face each day full of energy after a great night's sleep, thanks to the most elegant, unobtrusive and effective snoring treatment. Say GOOD NIGHT to snoring with your own Stop Snoring Ring. Remember, it's a risk-free purchase. Simply wear the ring on your little finger, exactly as instructed and ideally put it on at least 30 minutes before going to bed. Trust us with your email address and in return and we'll make sure you're the first to know about the latest innovations in the world of sleep science. We are always looking for new products that have a purpose and that's one purpose only: to help you get a better sleep. There'll be offers and discounts and great opportunities to learn more about how you can get a better sleep. Q: How will I know if it will work for me? A: Goood question. You'll only find out by trying the ring. That's why we offer an absolutely no-quibble 30 day money-back guarantee. We are not interested in selling something to you that doesn't work and always honour our full refund policy. Q: Isn't acupressure a bit crack-pot? Q: Why should I use this ring as opposed to other snoring treatments? A: Your Good Night Snoring Ring is stylish and elegant, it's completely unlike many of the alternatives, such as mouthpieces, which are about as far from unobtrusive as you can get. Neither does it involve any drugs of course and the potential side effects that could go with any sort of drug. Because of the nature of other potential treatments, you won't always find a 30 day money back guarantee is offered either. 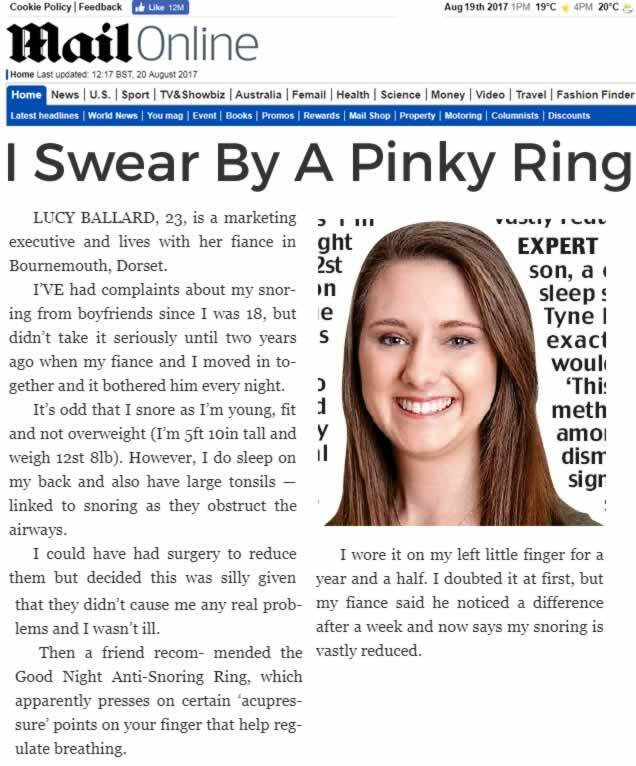 A: Yes, this is the original Good Night Snoring Ring and it has been poorly copied a few times now. However, this is the original product, the clinically trialled product and we guarantee a full refund should you give the ring a good try to help you stop snoring. You might save money elsewhere, but won't be seeing any of your cash back should the snoring ring not be right for you. 60% of all adults snore at some time or other. 40% do so regularly. The Good Night Anti-Snoring Ring could be the answer for you. 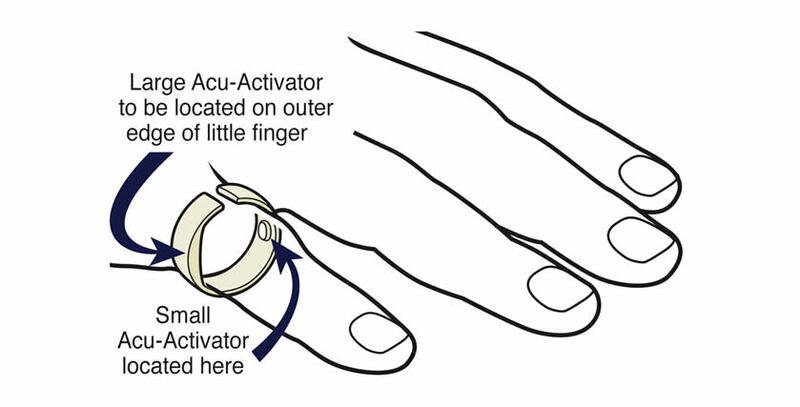 The ring has two triggers that activate two acupressure points located on the little finger, so that the airways and natural biorhythms are cleared to guarantee you and your partner a restful night without snoring. Can Acupressure Help Stop Snoring? We collect "personal" information from you when you provide it to us. For example, if you purchase a product from us, we collect your name, mailing address, telephone number, and email address. If you sign up to receive a newsletter, we will collect your email address. If you utilize Services or take advantage of special offers made by us or our marketing partners, we may collect other personal information about you. If you are no longer interested in receiving e-mail announcements and other marketing information from us, you can control communication preferences from within your personal account area of our Site. If you experience problems with this communication feature please e-mail your request to[email protected] Please include your complete name and mailing address (as well as your e-mail address) if you prefer not to receive direct mail postcards or catalogues. Note that you may still receive customer service related communications from us. In addition, like almost all e-commerce web sites, we use "cookies." Cookies are bits of information that are stored on your computer by your web browser. Although our cookies don’t store any of your personal information, they do allow us to do things like keep items in your shopping cart between visits or during the same visit or provide you with a more personalized user experience. Whether you want your web browser to accept cookies or not is up to you. If you haven’t changed your computer’s settings, most likely your browser already accepts cookies. If your personal information changes, you may correct, update or remove personal information previously provided to us by accessing your personal account area of our Site.